The developers behind Urban Empire were originally a Finnish company called Fragment Production Oy which was founded in 2012. In 2013 they released a PC rescue simulation game called Rescue – Everyday Heroes and followed this up with a sequel called Rescue 2 – Everyday Heroes in 2015. Both of these games don't have Metacritic scores but Rescue 2 does have a Steam rating of "Mixed" where 54% of the 134 user reviews of the game are positive. The company was renamed in 2016 to Reborn Games prior to the release of Urban Empire in 2017. So, what exactly is Urban Empire? It's a mix of your typical city builder and political simulator. To some degree, it reminds me of games like Tropico where you have to try to retain your power whilst developing your nation. 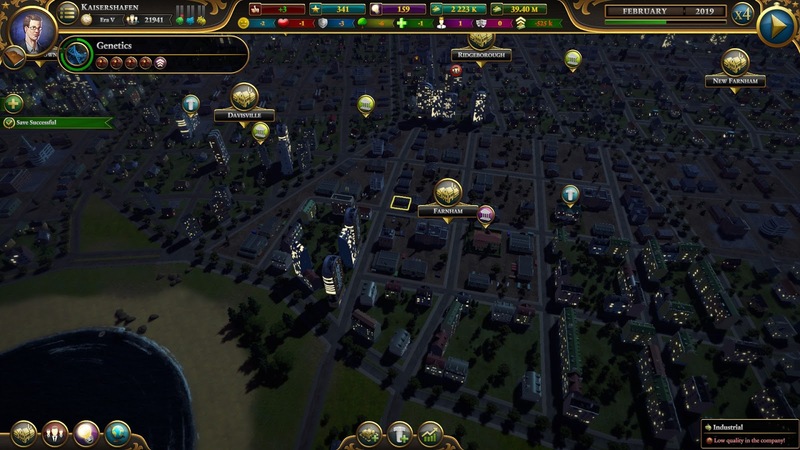 In the case of Urban Empire, instead of developing a nation, you're developing one city, and you don't have as much freedom as you do in Tropico for many aspects (e.g. placement of buildings, control of the economy, the ability to run as a dictatorship, etc.). The game definitely focuses more on role-playing in that you can pick one of four dynasties to see the development of a city from the 19th century to the present although every action that you perform has to be brought to the vote in the City Council and only through the powers of persuasion and keen business acumen will you be able to keep developing the city the way you want it. Urban Empire currently holds a Metascore of 62 on Metacritic and has a rating of "Mostly Negative" on Steam due to only 35% of the 1,749 reviews for the game being positive. So, is it really that bad? It's pretty rare to find anyone buying a retail copy of a PC game nowadays, myself included. So, you might find it surprising that I actually have a physical Pile of Shame sitting on the printer right next to me. I really should probably get rid of this physical Pile of Shame first, since who knows how many of them actually have *gasp* DVDs in them and whose to know whether my next PC will even have an optical drive (my wife's new PC definitely doesn't)? Anyway, I had a look at this pile and it turned out that Urban Empire was one of the games in there. Oh, but why did I get the game? Well, I bought the game when it was on sale at EB Games: normally the game sold for $60 but it was selling for $18 the day I purchased it and since I love city builders and political sims, I thought the merging of these two genres was a match made in Heaven! One aspect I liked about the Tropico games is that you could role-play as a leader – which meant your character could have different traits that would affect your gameplay experience. Urban Empire is similar in this regard but not only do you control one leader, you control an entire dynasty that spans 200 years. Throughout the game you'll experience a whole bunch of events where you'll have to make some tough decisions. Sometimes the decisions you make affect the city although other times it will affect the way the mayor (i.e. your character) is perceived by the city's denizens. It's great and definitely one of the game's strengths. The soundtrack (composed by Tapani Siirtola) is another strength of the game which changes as the game progresses throughout the eras. My personal favourite is one that is played in the first era aptly named "Birth of the City". There are 74 Steam Achievements to earn and 9 Steam Trading Cards to collect. The main issue I had with this game is that I didn't know what I was doing and the data you're given in the game doesn't help you make informed decisions. Unfortunately, the game's manual isn't too much help either so the only place to go to search for help is from other people who have already played the game through forums and the like. The game has lots of screens that contain data, don't get me wrong, but either the data displayed is entirely useless or it was too difficult for me to decipher. I eventually failed the first time I had a go at the campaign since I was running the budget into the ground, despite following all the advice they gave to me in the tutorial! After reading for some pointers online, it turns out I was meant to slowly work my way up by just zoning low infrastructure, low density suburbs everywhere. While this definitely helped me in my new game to ensure I had positive cashflow, I also couldn't successfully develop any of these low-density suburbs into medium or high-density ones; the information to assist me in this endeavour was lacking and every time I tried experimenting with the idea (e.g. by connecting utilities and telecommunications in the suburb as well as widening the roads) it just resulted in suburbs that were a huge drain on the city budget. It also didn't help me that the Council were actually voting to give city residents tax cuts… like councils in real life would ever be generous enough to do such a thing 😉. 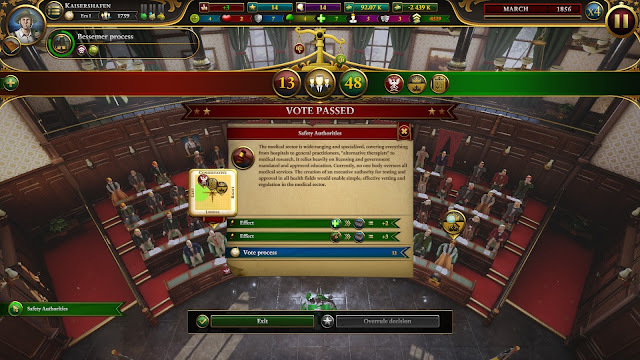 Unlike Tropico where you have executive power to do just about anything you want (even under a democratic form of government) everything in Urban Empire has to go through the council. Want to rezone a suburb? Vote on it in the Council. Want to build a new train station? Vote on it in the Council. Want to change tax rates? Vote on it in the Council. Want to add a new phone booth to a suburb? Vote on it in the… okay you get my point. While this is how the game forces you to dabble with the political aspect of the game (as you'll have to use intimidation, charisma or less savoury ways of convincing the Council to vote on your resolutions) it eventually becomes a bit of a chore since so many actions require Council approval and it all becomes a matter of clicking random buttons in the hope you can convince parties to vote your way without damaging your relationship with them too much (since this adversely affects your performance at mayoral elections). 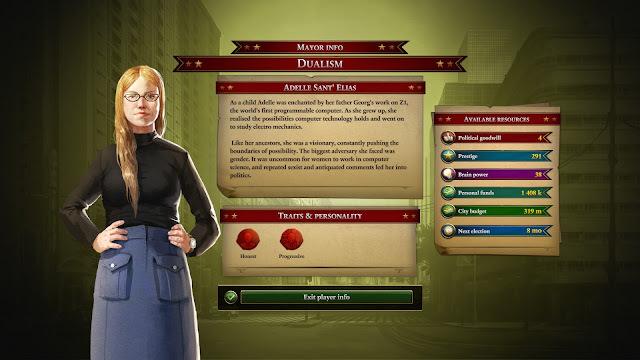 Urban Empire has ambitious goals in trying to work as a city builder and political simulator, yet by attempting to cobble a game that will appease fans of both genres, it ends up being a rather restrictive and confusing city builder, with a rather bland political layer. Sure, the soundtrack is pretty good and I love how you can roleplay as generations of mayors that belong to one of four dynasties, but those are the only things that are really going for this game. Tropico seems to be the preferable choice if you want something that strikes the perfect balance between city builder and political sim; Reborn Games have given their best shot at it, but they're not quite there yet. Is the game worth $42.95 AUD? : No. I think $20 would be a fairer price considering you can get the older Tropico games for this much and I feel they are slightly superior titles compared to what's on offer in Urban Empire.